Luxe new multi-tasking Beauty Butter moisturizer deeply penetrates and hydrates, restoring skin’s natural lipid barrier while removing damaging toxins. 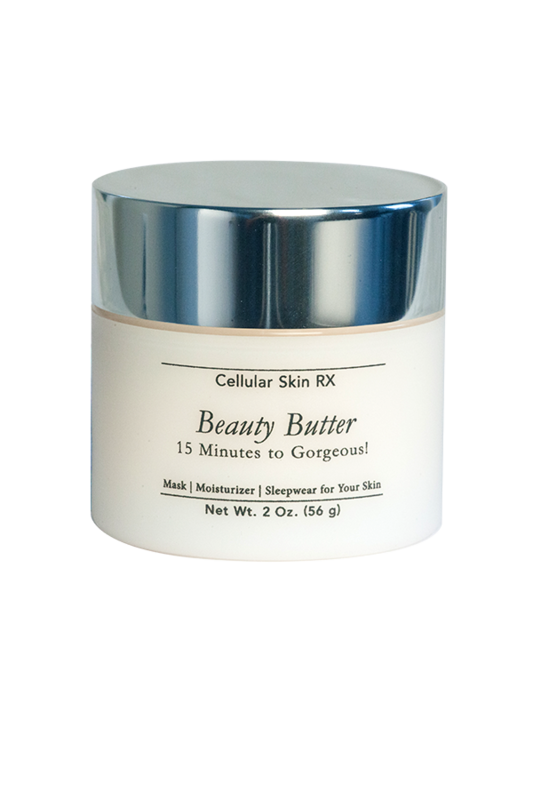 In just 15 minutes, this divine butter leaves skin silky smooth, glowing and infused with protective antioxidants. Use it as a daily moisturizer, a 15 Minutes to Gorgeous leave-on/rinse-off mask, or as sleepwear-for-your-skin all night moisturizing treatment. Powerful antioxidant Astaxanthin combines with black raspberry and black cumin oils to provide superior, long-lasting protection from free radical damage. Swiss Garden Cress extract brimming with vitamins A, C and K detoxifies stressed, damaged skin. Rough, dry skin is restored to its original vibrancy. Luscious shea butter, sea buckthorn oil, sunflower oil, olive oil, safflower oil and jojoba oil extracts restore and maintain skin’s natural lipid barrier. When this barrier is maintained, skin’s cellular functions are optimized, resulting in a smoother, more elastic and resilient complexion. Fine lines disappear. Deeper creases are softened. Overall, a healthier complexion is revealed. Get your glow on, Glow Girls and Boys. Just 15 Minutes to…Gorgeous! To use as a daily facial moisturizer, after applying any other serums/complexes, gently pat into skin paying extra attention to dryer areas. To use as a 15 Minutes to Gorgeous! daily mask, apply a generous amount to clean skin including eye area. Wait 15 minutes then gently press warm washcloth all over face (do not rub)to remove excess mask. Massage any remaining mask into skin. Step back and admire your gorgeousness! To use as sleepwear-for-your-skin, apply a generous amount of Beauty Butter to cover all areas you wish to detoxify and moisturize. In morning, rinse off with lukewarm water, pat dry. Follow with other treatment products. Apply generously for best results on normal, dry, and/or mature skin. Combination skin should avoid use in the t-zone or other oily areas where extra moisture is not needed. At least twice weekly 15 Minutes to Gorgeous mask use is recommended to help remove daily toxin build-up from smoke, pollution, and other skin stressors.